Friends...I need your help. I've been thinking about something for a long time and I need to decide whether it's finally time. It's one of those major life decisions that one should never make on ones own. And to tell you the truth, I am more than a little stressed about it. Should I...shouldn't I. And if I do...which one should I choose. I just need to dive and tell you what's been on my mind. Quit beating around the bush and just go for it. Here goes! I've been seriously thinking about getting my hair cut.....short! What's your first thought when I say that? No, don't do it or Yes, sounds like fun. My situation is this. I've been having it shoulderish length for a while now and although I like it, I'm happiest when it's pulled back in a twist or ponytail. Why? Oh, who the heck knows, but I know I just hate dealing with hair. So shorter hair seems a natural. Plus I have a little head and face, so short hair works for me. At least I think it does. Spent sometime on the ole Internet and found a few styles and I need you to help be decide. My stylist, Sebastian told me to bring in a picture of something I liked and we can work off that. Please look through these styles and then tell me which ones you like or don't like. You can even tell me I'm crazy for even thinking about this. 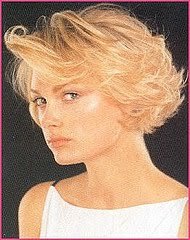 This one would probably be a good transition from medium length to shorter length...but since I have pencil straight hair I would need to curl it. Might be more work than I really want. Plus, I think this "do" requires thicker hair than what I actually have. This one is a little more stylized and I think I might be able to pull this off. 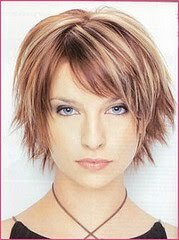 This one is very cute and should would work with my thin hair. This seems like a style my hair could pull off. I also think it's a style that I could actually do every morning. Here's one's that's super cute...but very dramatic. Do I have the guts to do this one? Here's a more messy, punky style. I think this is a longer version of Style #6, which I also like. Now I need your help. Take a look at the styles and let me know in the comments, which one you like the best. If you need a reminder of my face shape...just visit my profile page. The "do" with the most votes wins. You can also say don't cut it if you think I'm totally delusional. I am really counting on you. I know the agony of trying to decide because I go back and forth all the time. But when I've decided to go for it I remind myself it's just hair, it will grow back. So go for it. I like 3 or 5. I say #4. Do it and I think you'll really love it! DO IT!! I want to as well but every time I cut it short I want it long again. I love #6 but if that is too scary #4!! Oh, I can't wait to see after pictures!! Sassy and cute #4 ... seems to suit your personality! But, 3 is super cute...I'm bad at making decisions! So 3 or 4! I vote 3,6,7. I see a lot of votes for 4 - I just feel like it's a little masculine. But then again, maybe it's because it's not as styled as the others. You have such a pretty face - little and delicate - that I think short hair would suit you! I usually go really long, then get sick of it, the go short short. Sounds like you're ready for short! Oh I really like #3, very stylish. If you have a small head and face, go for it! it can always grow back. I wouldn't go super short all at once, ease in to that. 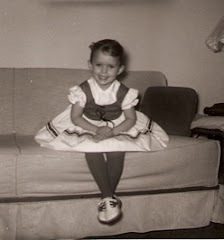 About my blog, marlene and you were right! I needed to get out of the mode i was in. Thank you!! I say go with #5. It's dramatic and fun! It's the length I used to wear and so easy to manage. If it ends up being too short within 6 weeks you'll be into #6 and then on to #7. Be sure to do it before the big wedding. I'll need lots of pics of my cous! Yeah Lori! You got your google id set up. Now you can comment more and become a Follower. I've been stuck on 34 way too long. 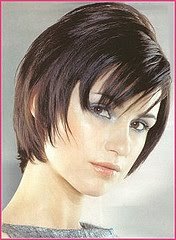 Getting your hair cut short is a great idea....just make sure you trust your stylist or you could be a Sinead . (She is actually very beautiful) I hope it goes well and I hope you post a photo...would love to see what your gorgeous new do looks like! #3 or #7. While I appreciate that everyone is rooting for #4, I worry that on a flat hair day it could end up resembling a certain high school mullet photo that you might be painfully aware of. Just a thought. I like 3. I'm your newest follower. Stop over and see me if you can.